A beautiful addition to a salad, David Wolfe calls radishes a beauty food because they are high in sulfur, silicon, and vitamin C. Watermelon radishes are a type of daikon, and originated in China. With a soil temperature preference that ranges from 45-95 degrees Fahrenheit, these roots veggies aren’t exactly picky. They have low nutrient requirements and shouldn’t be grown with excessive nitrogen. They do best when they’re not too hot, so late summer or early fall is the best time to plant them! After you sow seeds, look for sprouts 4-12 days later. Roots reach maturity after a mere two months or less, when the above ground parts reach about 4-6 inches. You can enjoy the roots as well as the shoots! If you love to cook, chances are that you always have garlic in your kitchen. Back in February we talked about how you can regrow garlic by separating the cloves and sowing them under a couple inches of soil. You can plant garlic twice a year: once in early spring and again in early fall. Some garlic varieties like to be kept cool during the first couple months of growth (under 50 degrees Fahrenheit). If your winter is more mild, plant softneck types, which do better in this climate. Those with very cold winters will want to mulch over garlic beds to keep them warm. Garlic is a lover, not a fighter, so weed its beds thoroughly so it doesn’t have to compete. Vitamin-rich mustard greens are fairly easy to grow, thus you can plant them from seed outdoors with good results. They like cool weather, but should be planted about 3 weeks before the first frost in your area. You can sow seeds every three weeks to keep a steady harvest going. Like garlic, mustard greens grow better when they don’t have to compete with other weeds. Harvest young leaves, as they get more bitter as they age. If mustard seed is what you crave, let the plants go to seed and collect the delicious seeds, which you can use to make mustard or just as they are. In salad, stir fry, with cheesy pasta or just plain raw, there are dozens of ways to enjoy broccoli. Juice the stalks to get the most out of this crop! You can sow broccoli seeds outdoors about 8 weeks before the first fall frost in your area. They germinate well at 60-70 degrees Fahrenheit, and like very fertile, well-drained soil. Experiment with different types of broccoli. Sprouting varieties do well in mild climates from fall to spring, and grow into bushes. Romanesco varieties need lots of space and produce really amazing buds with a natural fractal pattern (worth a Google search if you’ve never seen one). Broccoli rab has a stronger flavor and is commonly used in Asian and Italian cooking. This one’s for extra credit, but you might be surprised by your success in growing these delicious fruits! Fall is the perfect time to put plants in the ground, just find the right variety for your climate. In general, lowbush varieties are hardy, whereas highbush types like a little more warmth. The trick with blueberries is that they like very acidic soil. 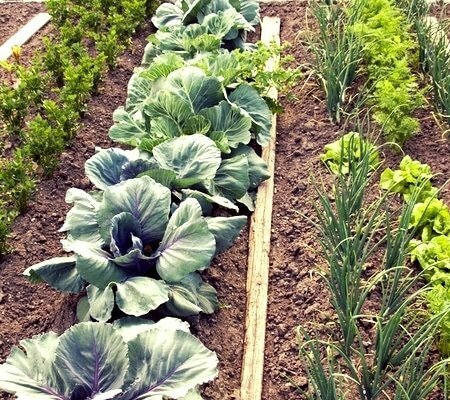 Here on the west coast, our soil is naturally alkaline, but there are many ways to decrease the pH of your soil (ideally, you’ll want it between 4 and 5.5). Composted pine needles, leaves, or coffee grounds are a few ways to naturally increase soil acidity. Your next challenge will be keeping birds from eating all your fruit. That, and perfecting your recipe for blueberry pie. Have you had any success with one of these plants? Do you have other plants you like to sow in the early fall? Tell us in the comments below! Used tea leaves are great compost as well!